So if I got myself a Schecter Omen Extreme-6 FR for my birthday, what did I get myself for Christmas? 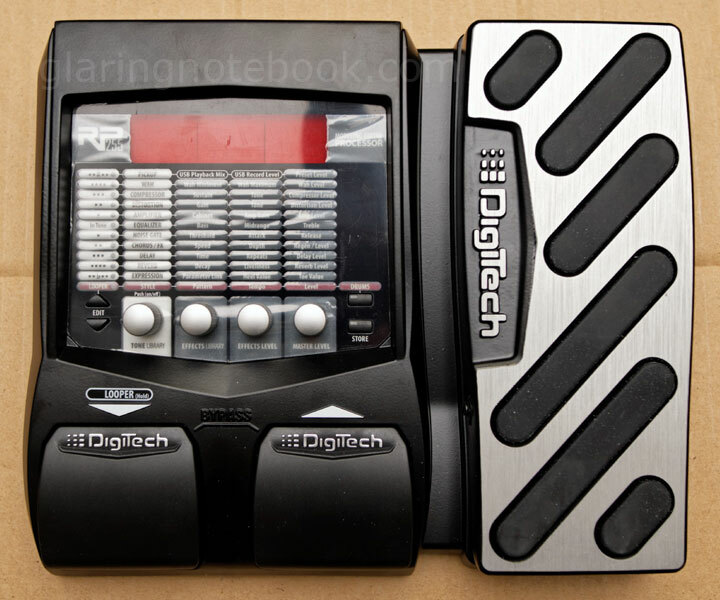 A Digitech RP255 guitar multi-effect processor! To be honest, I hankered for effects within the first day of playing with my new electric guitar. I used to have live sound effects on my SoundBlaster Live! 5.1 soundcard but that died, and Creative doesn’t put the sound effects in their newer EAX 5.0 cards anymore. I used to have so much fun with the SoundBlaster, as it had a pitch shifter, auto-wah, distortion, flanger, reverb, delay and the works! With my current integrated soundcard, all I can do is boost the microphone signal to +20 decibels and rely on this digital overdrive. The RP255 is the cheapest of the current series to have an expression pedal and a looper. The RP355, one step up, adds XLR jacks. What really sold me on this, compared to say a Line 6, Boss, Rocktron, Zoom, was that it had a 20 second looper for that price, under RM700 (during the Bentley year-end sale.) The Zoom multi-effects pedals at that price had a 5 second looper, certainly not long enough! The Boss multi-effects pedals didn’t have a pitch shifter. Line 6 was out of my budget. A pitch shifter is important to me because I have a Floyd Rose floating bridge and I don’t want to painstakingly retune my guitar each time I want to detune my guitar down an entire step. I can also drop it down an octave to become a bass, or pull it up like a whammy pedal would. I also particularly like the user interface – I played around with all the settings, activating the looper and jamming with myself. I then read the manual, and I found I didn’t learn anything new, because I’d already figured everything out! It has 120 preset tones – the first 60 can be overwritten. I can also download the X-Edit software and plug it via USB to download the preset tone into the RP255! Unfortunately my Windows 7 installation is a bit broken so I need to reformat so I can get X-Edit to install properly – more on that once I get around to that! I’d then install Cubase LE 5, included with the RP255. Since I have a 6.35″ to 3.5″ jack converter (and 3.5″ to 6.35″ as well) I can plug the RP255 straight into speakers, or into my Sony A77’s mike jack! I shall record a video of me using the looper and the pitch-shifted bass once I have an awesome riff to show. So does it sound digital? I wouldn’t know, really, unless I heard it side-by-side with an analog signal. There is an analog tone, though. In other news, I broke the low E string again – this time, it seemed to just loosen up at the bridge end. So I clipped it and reversed the string, putting it back in. I should’ve known when it started acting up, since it kept detuning rapidly within 1 minute of bending. This entry was posted in Geek, Music, Pictures on December 30, 2011 by 2konbla.